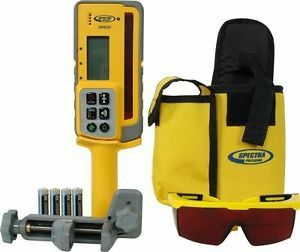 The Spectra Precision DR400 all-in-one DigiRod is a combination of a Laser Receiver with digital readout, Laser Distance measurer and built-in tilt sensor. 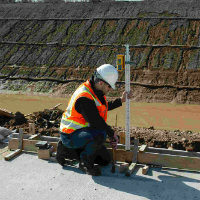 It provides information required to take Staff-less, accurate grade readings even at tilt angles up to 30 degrees. Use Anywhere where traditional laser receivers and grade rods are used. Extremely portable, universal system that eliminates the need to carry, transport or maintain multiple grade rod types. Increases safety, reducing the need to lean over or go into excavations or trenches. Increases accuracy, the internal angle compensation system reduces errors and extra material costs due to tilted grade rods. Increases productivity by always having the correct rod on-hand and eliminating marks on screeded concrete. Easy to use - the simple graphical display and bright backlight allow for fast readings in low light. Works with existing rotating lasers, increasing productivity with a fast payback. Increases productivity by one tool having multiple applications. 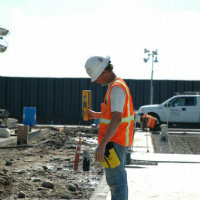 Increases safety by allowing one person to make accurate readings in difficult-to-reach areas. 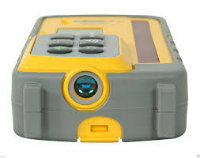 Increases accuracy, eliminating issues with sagging or miss-held tapes at different temperatures. Large 12.7 cm reception height allows faster readings by acquiring the beam quickly, and makes it easier to stay in the beam. Simultaneous elevation LEDs and bright backlight reinforces the elevation display in low light for faster readings.